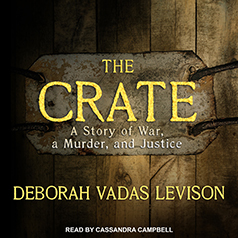 Written in searing, lyrical prose, The Crate: A Story of War, a Murder, and Justice examines man's seemingly limitless capacity for evil . . . but also, his capacity for good. Contains mature themes. After surviving the horrors of the Holocaust—in ghettos, on death marches, and in concentration camps—a young couple seeks refuge in Canada. They settle into a new life, certain that the terrors of their past are behind them. They build themselves a cozy little cottage on a lake in Muskoka, a cottage that becomes emblematic of their victory over the Nazis. The charming retreat is a safe haven, a refuge from haunted memories. That is, until a single act of unspeakable violence defiles their sanctuary. Poking around the dark crawl space beneath their cottage, they discover a wooden crate, nailed tightly shut and almost hidden from view. Nothing could have prepared them for the horror of the crate's contents—or how the peace and tranquility of their lives would be shattered. Now, their daughter, Debbie Levison, an award-winning journalist, tells the extraordinary account of her parents' ordeals, both in one of the darkest times in world history and their present-day lives. Written in searing, lyrical prose, The Crate: A Story of War, a Murder, and Justice examines man's seemingly limitless capacity for evil . . . but also, his capacity for good.